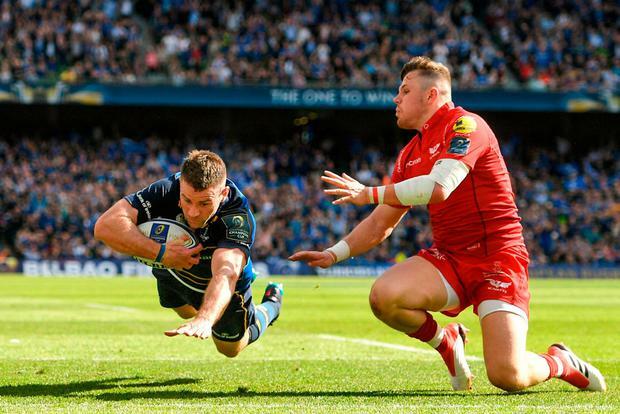 Fergus McFadden will miss Leinster's Champions Cup final and the Guinness PRO14 play-offs after damaging his hamstring in the win over the Scarlets. The Ireland winger has been a regular starter in the province's biggest games this season but having played a big part in getting them to Bilbao he will miss the clash with Racing 92. There was some good news ahead of the game, with senior coach Stuart Lancaster confirming that Luke McGrath and Jordi Murphy are fit to play and Rhys Ruddock is in with a chance of making it if he makes it through the first half of the week's training. "It's a huge blow for him (McFadden), he played so well and fought his way back into form, into the team in a really competitive position," Lancaster said. "To be out for the rest of the season, not just the Champions Cup final but the semi-final the week after as well. "We're blessed that we've got a number of players in that position, but it's really disappointing for him." McGrath's return could squeeze Jamison Gibson-Park out of the team with James Lowe coming in for McFadden on the wing. "We're pretty optimistic now. We trained mid-week last week and he trained on the Tuesday and the Wednesday and there's been no reaction to that," Lancaster said of McGrath. "We're going to train now, we're training Tuesday, Wednesday off. We're very optimistic. "It's a competitive position with Nick McCarthy there as well. "Luke's a high quality player, the biggest bonus for me was the performance of Jamison in the semi-final - to have him step up and play at that level against such a good team. "I know that was really positive for him, but having Luke come back into the equation as an experienced player is great for us. We've got some decisions to make there. "Rhys - we'll see how today goes, he's made great progress. A set-back in the Saracens game, but he's training today so he's available." Although they have lost influential captain Maxime Machenaud for the game, Lancaster is highly wary of Racing's threat. "He is (a loss), it's desperately disappointing for him because he's a champion player and we've had a couple of those injuries in the club this year, we know how heartbreaking it is for coaches and players alike," he said. "Their replacement is very good and we've got people like Sean O'Brien, Josh van der Flier and Fergus McFadden. "Every team has these injuries, but it's the depth of the Racing squad that makes them a threat. "Whoever they bring in is a quality player. "I think they're a side that has come to their peak at the end of the season, when I look at their performances towards the end of the year they have been getting better and better and better. "Two notable performances (stand out), Clermont at home in the quarter-final was a huge win for them and then obviously you back that up by beating Munster in the way that they did. "I know Munster came back into the game, but the damage that Racing did in the first-half… They obviously beat Agen at the weekend with a much-changed team, but it was (still) an unbelievably strong team. "The depth of their squad is phenomenal. "Any team that can leave Dan Carter on the bench is a serious threat. "They've got threats all over the park, they've rested a lot of their key men for the weekend's game and it's a serious challenge." David Kelly To become the top dog in Europe, sometimes a team need to cry havoc and let loose the dogs of war, to quote 'The Bard'.